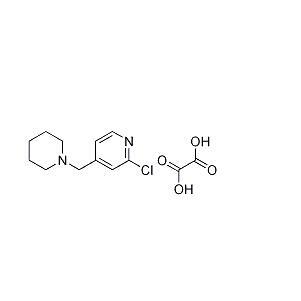 Lafutidine pyridine ethanedioate CAS number is 406484-56-8, through in-depth study of the synthetic route of lafutidine and we found that lafutidine pyridine ethanedioate is the key raw material for the synthesis of lafutidine. How to obtain this intermediate through a simple step,which determined the synthetic cost of synthetic lafutidine. One method is more reliable, the specific method is as follows: (1) in the ice salt bath under freezing conditions, Dropping nitrite aqueous solution in acid and 2-amino-4-methyl pyridine for reaction, and then raising the temperature to 70-100 DEG C, after 15-30 minutes, cooling, adjusting PH value 6.0-8.0, heating to 60 DEG C, extracting the hot reaction solution with ethyl acetate, recrystallizing, get a white solid product; (2) add POCl3 into the obtained white solid, heated to 80-110 ° C, refluxed with stirring for 5-15 hours, cooled, carefully poured into cold water and ammonia, maintaining the temperature 20-35 ° C, The pH value in the bath adjusted to 10.0-11.5 with ammonia, and distilled under reduced pressure to give the compound 2-chloro-4-methylpyridine; (3) use CCl4 as a solvent, dropwise SO2Cl2 in the compound of 2-chloro-4-methylpyridine, Adding the radical initiator in batches during the dropwise addition, reacting for 2-8 hours, after cool down the temperature, adjusting the PH value to 6.0-8.0 with saturated sodium bicarbonate, the compound 2-chloro-4-chloromethylpyridine is obtained by distillation under reduced pressure; (4) using DMF as a solvent, potassium carbonate as an acid-binding agent, 2-chloro -4-chloromethylpyridine is condensed with piperidine to give Lafutidine pyridine ethanedioate CAS number 406484-56-8,2-Chloro-4-(1-piperidinylmethyl)pyridine ethanedioate. Looking for ideal Anti-Ulcerative Drug 406484-56-8 Manufacturer & supplier ? We have a wide selection at great prices to help you get creative. All the Lafutifine Intermediate CAS 406484-56-8 are quality guaranteed. We are China Origin Factory of CAS Number 406484-56-8. If you have any question, please feel free to contact us.